Red Stripe, that oddly-bottled Jamaican beer your annoying hipster friend is more likely to order after everyone else has ordered some banal domestic brew, has gotten into trouble over its marketing strategy for the cloying new beverage Red Stripe Burst, a raspberry-flavored illness inducer the company is pitching to 18 to 24-year-old women. But wait, isn't the drinking age in America still 21?? It sure is, which is why concerned parents in America are busy this weekend expressing their outrage at Red Stripe. 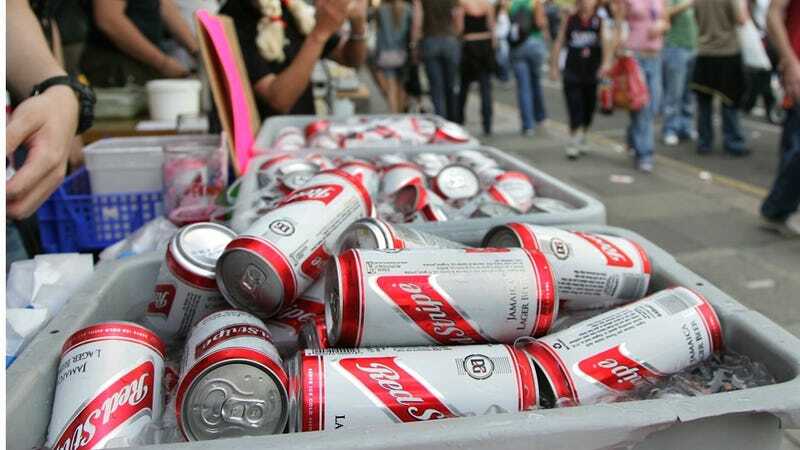 In Jamaica, the legal drinking age is 18, but Red Stripe has come under fire in the US for Burst, a beverage that belongs to a family of fizzy, sweet booze-sodas the advocacy group Alcohol Justice describes as "cocktails on training wheels," and, more reminiscent of candy cigarette criticisms, a "recruitment-driven" beverage. The logic is that beverages like Burst, Mike's Hard Lemonade, and Smirnoff Ice accustom the reluctant young drinker to the pleasures of booze, thereby paving the way for a future of recreational drinking that ends with the inevitable nightly bottle-and-a-half of Chardonnay paired with reheated Tupperware spaghetti. Alone. Watching Homeland. Red Stripe certainly isn't the first industry booze-purveyor to purposely market its syrup beers to the high school house party demographic with flashy commercials during episodes of Keeping Up with the Kardashians. It's a little distressing, however, that booze brands are still gendering their drinks, as if teenage boys with little highball experience didn't also deplore the taste of unsweetened booze. Can we stop pretending that only young women drink gross, cloying cocktails, or that young women somehow can't develop an appreciation for scotch that's been fermenting in a Scotsman's belly button for 15 years? Booze is gross — it takes like poison, because it is poison. You don't have to be a teetotaler to know that people have to develop, over the course of a young adulthood, an appreciation for certain kinds of booze before a glass of bourbon goes from a disgusting puddle of throat fire to a sweet, delicious pool of charming conversation.